What Makes Recreational Tree Climbing so Amazing? This list includes more than a basic/minimalist tree climbing setup and it’s not all-inclusive or ultra-light, but it does provide a strikingly accurate glimpse into the type of climbing gear an experienced recreational tree climber would likely use when traveling and climbing big trees, both locally and abroad. I am not sponsored by anyone or paid to promote any particular item. The list below is based solely on my personal and budgetary preferences, but I’m not opposed to accepting promotional sponsorships . Please email me directly, for more information. Much thanks goes to my buds at TreeBuzz, for all their valuable input and contributions to this list. While their valued opinions may vary, recreational tree climbers are similar, but different than tree care professionals. Rigging gear, chainsaws and climbing spurs are intentionally omitted, for that reason. What many consider an adequate length of climbing rope can differ, depending on typical tree size and the objective of any particular climb. While some trees, including the Redwoods, grow as high as three hundred feet in the Eastern Sierras of California, and Coastal Redwoods along the Northern California coastal area, the majority of climb worthy trees, throughout the world, are usually well within the 150 foot height range. Many agree at least a 120′ or 150′ rope length is adequate for most new climbers. It’s lightweight for packing and goes well with a carry-able climbing kit, suited specifically for backpacking and/or air-travel. Depending on various climbing objectives, static tree-climbing ropes are also usually available in lengths of 200′, 300′ and even 600′. Various splicing options are available at many tree climbing outfitters and adding a sewn or hand spliced eye on the end of a climbing rope is useful. Mechanical devices, like the Rope Runner and Akimbo, flatten a climbing line and they work better on some ropes than others. Weather conditions can also effect the performance of various climbing ropes. When purchasing climbing rope/s, check to be sure the rope you buy is well suited to your particular type of climbing system/s and the environment where it will be used most often. The following list provides an overview and a general guideline for the kind of gear used primarily for tree climbing purposes. The list is not all inclusive and certain items, like carabiners, may have multiple manufacturers producing similar products with the same functionality. Products in development, or currently available for pre-sale only, may be overlooked. As new items become available, I will try to keep this list properly augmented, but I make no promises as to how frequently this list gets updated. Please use your best judgment when selecting appropriate gear for your climbing system. An assortment of Loop Runners of varied sizes, for assisted tie-ins, re-directs, etc. Big Shot (8′ tall slingshot), used with a throw bag and throw line to achieve higher tie-in-points and with far better accuracy, compared to hand throws. Similar launching devices may include a crossbow, or a bow and arrow, usually with a spinning fishing reel to manage the throw line, or air cannons designed specifically for launching throw bags. A lightweight plastic tarp or nylon ground sheet – keeps your rope and stuff off the ground, dry, etc. No climbing spurs, but maybe a Silky handsaw for clearing deadwood, cutting firewood and light pruning, when and where it may be expressly permitted. Excluding the Big Shot, the above system fits into a standard size rolling duffel bag, in my case, weighing just over the airline’s 50lb weight limit. When traveling by air, some prefer to put the climbing hardware in a personal carry on bag, but getting gear through airport security can be touchy, so I prefer sending all my gear through checked baggage. By properly redistributing some of the weight, using a second piece of checked luggage, I’ve been able to meet the under/50lb weight requirement. Thereafter, I moved all the gear back into the one duffel size bag, for added convenience. Without the 10+/- lbs, or either the climbing rope or just the climbing hardware, my remaining gear weighs in at just under 50lbs. Certain non-life-bearing (PPE) items noted above can be used or shared among a crew of climbers, and while many items might be considered optional, I still feel strongly about each item being a vital component of the overall system. Specific trees may warrant more or less gear, such as a giant Redwood, where the lowest branch to launch a line into far exceeds 100′. A climber must be able to adapt to individual challenges. In conclusion, gear preferences do change and evolve as new products become available. Recreational or sport tree climbing has clearly a different purpose than for someone performing tree climbing services as a profession, although the two are not mutually exclusive, the sport climber’s gear is less cumbersome and risky without items like chainsaws and climbing spurs. TreeXP is a safe place for Recreational Tree Climbers and others who are enthusiastic and excited about connecting with Nature. This site is intended to promote the sport of tree climbing and help unite recreational tree climbers who prefer to climb in a non-invasive manner. 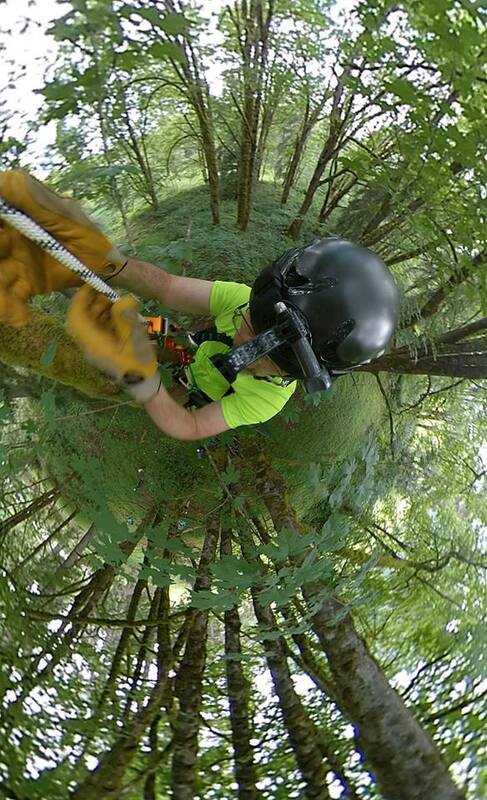 TreeXP offers professional recreational tree climbing consulting, demonstration and training services. We promote the sport of tree climbing as a way to improve oneself, both physically and spiritually. Obtaining professional tree-climbing instruction is recommended for anyone and everyone who wants to learn how to safely climb trees. Learning how to identify hazards and understanding the risk is mission-critical. Reading about it, or watching videos is no substitute for the real deal. Climb at your own risk. We welcome everyone's participation and input, so please email us directly and join us on Facebook @ Treexp.